Subscribe now at outdoors.org/Appalachia and get this and other issues of America’s longest-running journal of mountaineering and conservation, twice a year. The Rusty Pitons: New Jersey climbers find clues of major exploration 75 years ago. Five years ago, when authorities allowed climbers back onto many of the cliffs of northern New Jersey, the adventurers pulled themselves up onto escarpments and found rusty rings and iron pitons dating to the 1930s or 1940s. Buried under leaves on one of the ledges was a World War II-era carabineer stamped “USA,” and a bit of old three-stranded rope. Climber John Anderson dug into scattered papers, articles, and this hodgepodge of rusty gear, and he writes the story of the previously unknown days of early New Jersey cliff exploration. Master of Path Grading: An appreciation of J. Rayner Edmands. 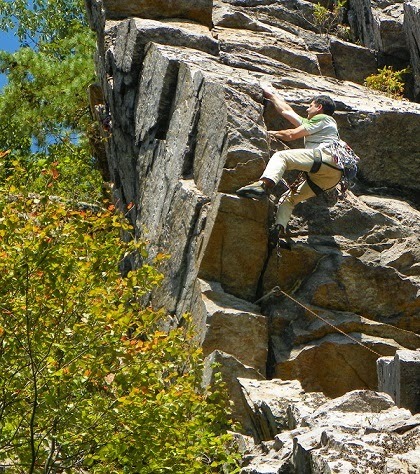 The modern era of path building in New Hampshire’s White Mountains began about 150 years ago as an exercise in marking the scrambles, straight up. Around 1888, along came Edmands, who dressed like a dandy in his knickers and red woven sash and told campers on the side of Mount Adams how to fold blankets and wash dishes with sand. Christine Woodside wanted to write this article when she looked at her feet on a hike up the Edmands Path on Mount Eisenhower. She writes that Edmands’s public image—eccentric trip leader—fights with the man he really had to be. After age 40, until his death of a stroke in 1910, when he was 60, Edmands devoted his summers to making good trails like the Randolph Path, Gulfside Trail, Westside Trail, and others, on sometimes impossible terrain. His trails followed the slopes’ contours. The rocks were neatly intertwined like a jigsaw puzzle. His dedication to connecting more people with the mountains put him in the middle of the movement against damaging logging in the Whites.